I talk a lot about the travel I do for work but I have friends who live on the road. At times, I’m jealous. It’s work I would love to do, but I love having a family and being home with them. A few weeks ago, one of my buddies called and said he was coming to Kalamazoo for a midweek job. He got in to town on Halloween and asked if I wanted to meet for dinner. I wanted to take my kids Trick-or-Treating first so I told him we could meet as long as he was ok with a later meal. He was good with and suggested I just meet him at his hotel and we’d go from there. He told me he was staying at the Four Points by Sheridan on Cork Street which I knew had a restaurant. He was pretty tired from travel and had to get up early the next day so I suggested we just hang there and have a few beers. 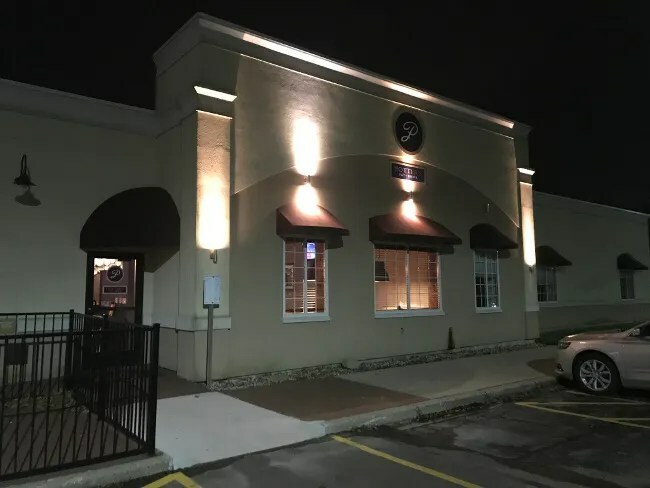 Potters Lounge and Restaurant is inside the Four Points by Sheridan on Cork Street just of the Sprinkle Road roundabout. The hotel is clearly visible from I-94 but a little difficult to figure out how to get in. Once you do, you can see a separate entrance for Potters but the main entrance is through the hotel lobby. 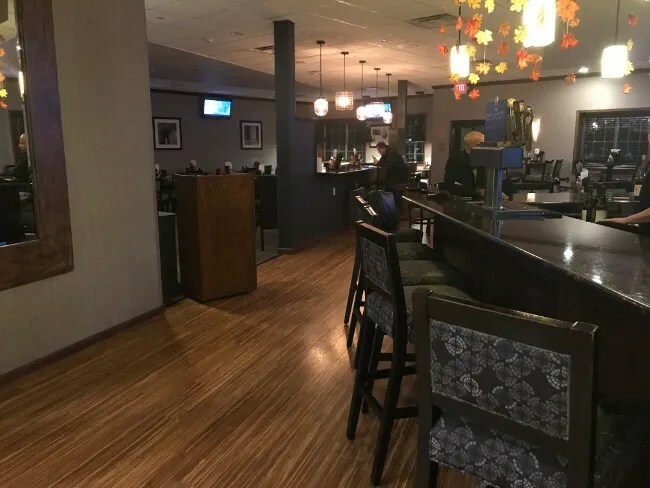 The entrance through the lobby brings you right in to the bar area. 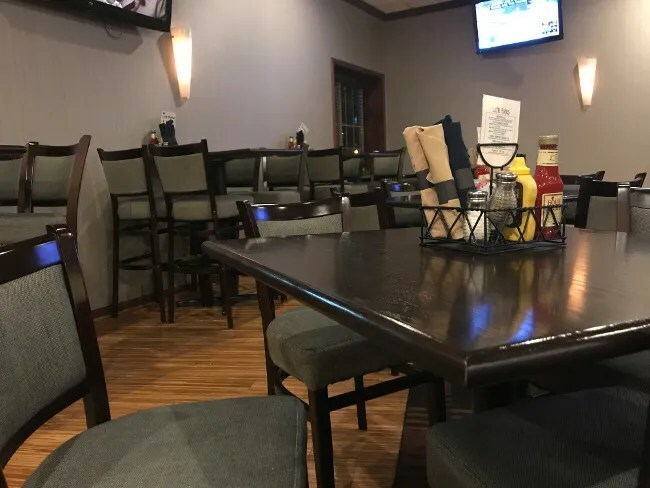 It’s not a huge bar with a little over a half a dozen seats but it’s a good size for the hotel. There was a large group of guys traveling with my buddy and they were all hanging out here when I walked in. The rest of the space is divided in to two dining spaces. There was only one other table late on this Tuesday night so the waiter told us to just take a seat where ever we liked. We picked a four top on the bar side of the dining room. The waiter followed us and set down both food and drink menus. We started with drinks. My buddy isn’t much of a beer guy so he stuck with Coke. I am more of a beer guy and they have some decent craft selections. I ordered a Founders Centennial IPA which comes in a bottle but a pilsner glass was brought with it so I poured it out. 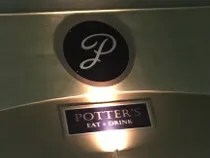 The dinner menu at Potters is part lounge part restaurant. You have the burgers, sandwiches, and pizzas, but there are also steaks and main courses. My buddy did the main course thing and ordered the meatloaf. It comes with mashed potatoes, beef gravy, haystack onions and choice of side and soup or salad. He got the white chicken chili and grilled vegetables. I didn’t get pictures but he cleaned his plate so I have to assume he enjoyed it. I ordered the Barnyard Burger. This one was unique. 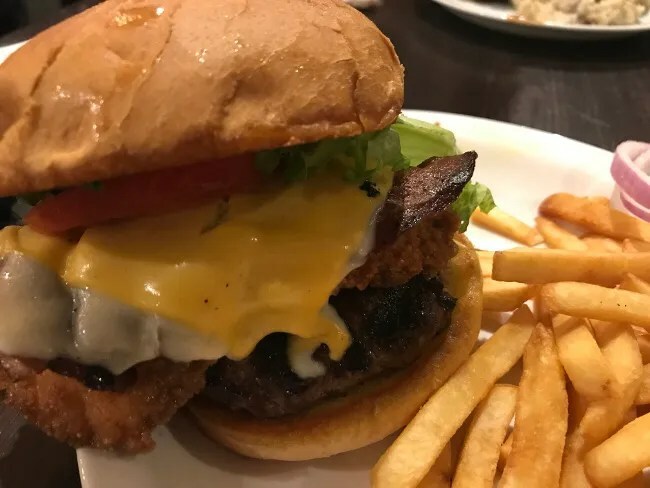 The burger is a half pound beef patty topped with a “chicken fried chicken breast” bacon, and Swiss and American cheeses. It’s served on an “old fashioned hamburger bun” alongside the typical lettuce, tomato, onion, and pickle. The side that comes with it is called “frips” which was described as a pub chip. I upgraded to the pub fries for an extra $2. This sandwich was large. The burger or the chicken patty would make a substantial sandwich on their own. The two of them made it almost impossible to get in my mouth. It quickly became a knife and fork sandwich with the cheeses on top of the chicken so I had to get a little of everything in each bite. Despite the challenges, it was quite delicious. The burger was slightly pink in the middle and the bun did kind of have that old fashioned flaky yet dense bread that I remember my grandma making. The pub fries weren’t really worth the extra money. They were good but they likely came out of a bag. My bill for dinner was just over $20 which I paid cash for. 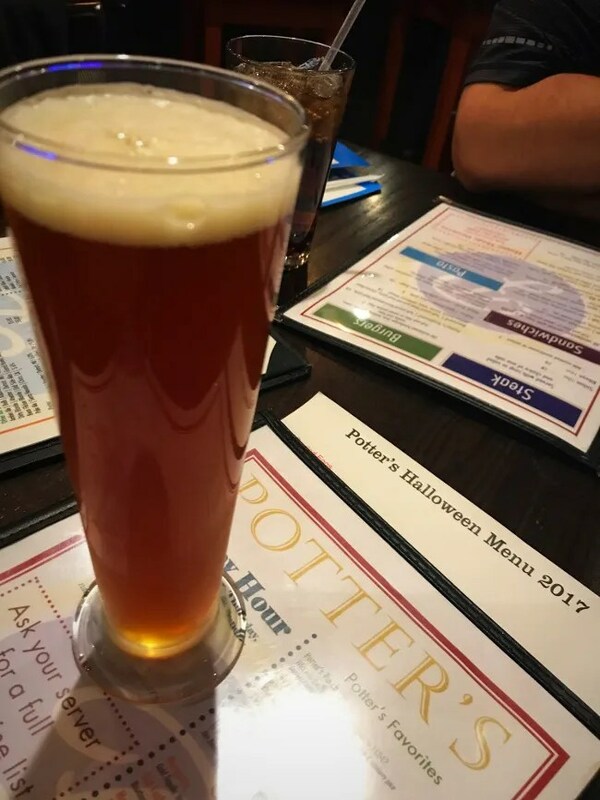 Potters Lounge & Restaurant is an above average hotel dining option. 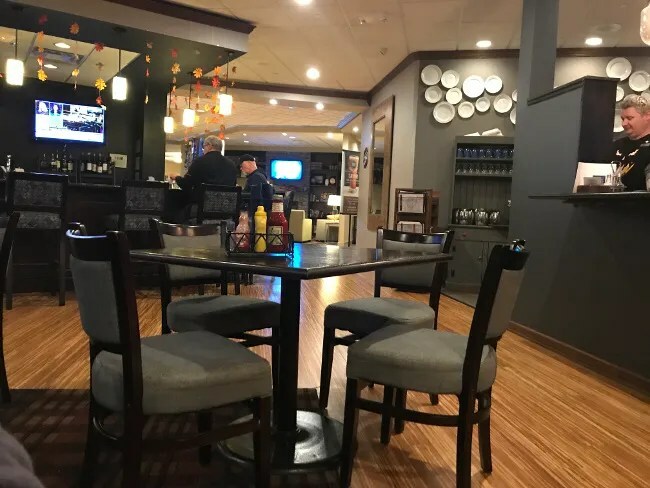 The food is pretty solid and while you get the feeling from the furniture that you’re in a hotel, once you settle in and kind of lose yourself in the meal, you’d be hard pressed to remember that. 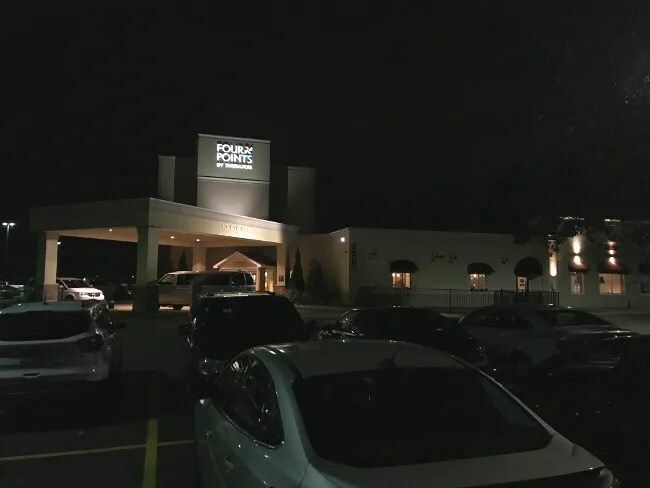 Potters kind of has the feeling of what hotels used to be but in a much more modern atmosphere.